Note that the English text follows normal English typesetting rules. Unfortunately, it seems that while modern word processors have at least nominal support for this, they don’t always work (e.g., OpenOffice.org would typeset the English part in the wrong font). Worse, the “professional” typesetting programs (except those that are actually made in C, J, or K, such as the ones made by Founder) do not seem to even support this. Adobe Illustrator supports a Japanese typographic rule called “tate-chū-yoko” (縦中横, meaning “horizontal [text] within vertical [text]”). 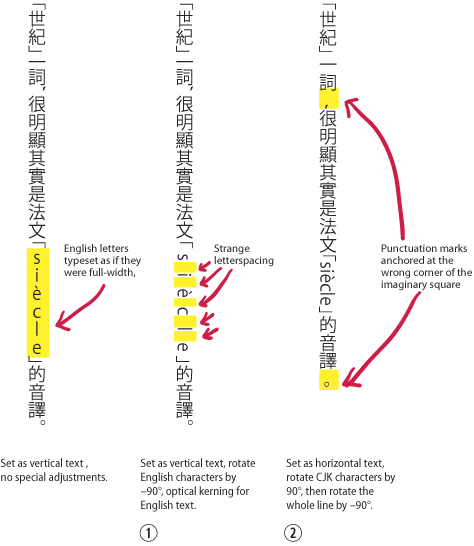 While this way of typesetting English text is also sometimes used in Chinese typesetting, it is not the normal way, especially when you are typesetting long pieces of prose. This is obviously not the desired result. It might be worth mentioning that in older-style word processors, such mixed texts are handled by the equivalent of rotating the CJK characters, then rotating the whole text block (i.e., example 2 above). Because of this, it sounds very strange that Illustrator cannot reproduce the expected result.